It turns out that Bryan Henderson's Godus godhood, earned through his victory in Curiosity, has an expiration date, after which his throne of omnipotence will go up for grabs. Bryan Henderson's reward for chipping away the last cubelet in Curiosity was nothing less than ascension to a digital Mount Olympus. Omniscient! Omnipotent! Immortal! 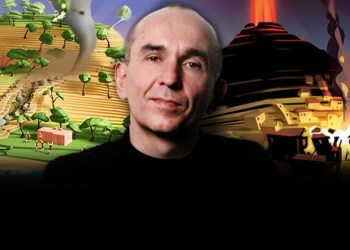 "You, the person who reached the center, will be the god of all people that are playing Godus," designer Peter Molyneux intoned in a video explaining the reward. "You will decide - intrinsically decide - on the rules that the game is played by." Henderson gets a piece of the Godus action too, which Molyneux said is the "life-changing" bit. "It means that you will decide on how people will play the game," Molyneux stated. "You will accrue riches from that game, from the start until the finish of your reign." As it turns out, that last bit is kind of important, because the finish of Henderson's reign will not be the end of the game. He'll enjoy a "grace period," not less than a few months and maybe not more than a year, during which he will be the unquestioned God of Gods, and then after that the ability to usurp the throne will be introduced to Godus. "It didn't seem right to me that Bryan would be God of Gods for all time," Molyneux told Rock, Paper, Shotgun. "It seems right to me that he has a period of time to be God of Gods, and that can't just be a few days. It needs to be substantial. And in that time, many things could happen. And of course, the amount of physical money he gets depends on how successful the game is. So he'll probably be God of Gods for an amount of time approaching a year. That'll be a year from release, by the way. It needs to be enough time to make it meaningful for him in every sense of the word." The actual length of his reign will be determined in large part by feedback from Godus backers, who will get their hands on the first alpha of the PC version tomorrow. He also said that while Henderson is the top dog, he won't have "carte blanche, uncontrolled" power. "Bryan can absolutely request something to happen, and we'll make our best effort to do it. But he can't decide everybody in Canada will explode or anything like that," he added. "There are limits to his power." It's still a win for Henderson, since I don't imagine many people will still be spending money on Godus a year after it comes out (and I doubt he'll still be playing it either) but it's kind of a letdown too. Heading the Godus pantheon may not be the Coolest Thing Ever, after all, but at least it seemed to be unique - "There can be only one," and all that sort of thing. But when there can be several, or maybe even quite a few? That takes a little bit of the shine off the crown.